I’m going to cut right to the chase and show you how you can private message a friend. But then don’t leave the page until you read below it because I want to share a little secret with you that not to many people know about. For this tutorial we are going to use my beautiful sister as an example. When you are scrolling through your newsfeed and you see a friend or even a Business page that you want to send a private message to, simply mouse over their name, a portion of their timeline will popup, and click on the Message box. Head over to the persons profile/timeline that you want to message. When there, click on the Message button and the same window that popped up in the image above will pop up. Once again you will be messaging with only that person. Instead of having to go to your friends/family timeline you can go straight to your message box and send a new message from there. This is also the place you can view all message that you have been a part of. Click on your message icon located at the top right of your screen. Notice the conversations you have been a part of and if you would like to to continue the conversation with someone just click within the box next to their image. To start a new conversation click Send a New Message. When you click Send a New Message the following box will pop up and you can begin typing the name of the person you wish to send a private message to. Once you find the person, choose their name and then begin typing your message to them. There you have it. 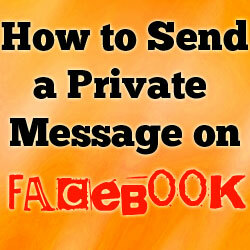 The 3 different ways you can send a private message in FB. Are Messages on Facebook Private? Thank you, this was very useful. The question I have is if you message multiple people – will it definitely exclude those not included? For example; if I ask in personal message to multiple people to like a website will other friends not included in the message see the request in anyway? Obviously I am very new at this. Only those that are within the message can see the message itself. Now if you are talking about having them “Like” a certain page on Facebook their friends will see what page they are liking. But if you are sending them to a website then, unless they tell others about it, they will be the only ones to see it. This peaked my curiosity though because I wanted to see if I sent a message to a group of people could those included in the message add others to the conversation. If not, as the originator of the conversation did I have the ability to add others. What I found was very surprising. My sister Melissa added her daughter, my niece to the conversation even though it said she was denied!! But get this, Crystal entered the conversation and said not only was she added but she could see the entire conversation we all had before she entered. Whoa, wait a minute! She was added to the conversation AND could see the entire conversation. This is crazy! I had NO clue you could do this. Did you? Knowing this, will you think again before you send a group message? NOTE: I did try this with a private message between me and someone else and it would not allow me to add anyone to that conversation. It appears that you can only add more people to a group message. As far as Affiliate Marketing goes, you got that right about the scams that are out there. I won’t even tell you the amount of money, time and energy I have spent on shiny objects that I just knew would make me money. I’ve been online since 1999 and there is only ONE place that I will recommend to anyone looking to make a business online. This is a community of people that have rallied together to help one another succeed online by offering their talents and knowledge. This place literally shows you EVERYTHING there is to know about building a business online and is the only place I go to that I can ask about different programs and they will tell me if it’s a scam or not. It’s completely free to join and you get two free websites that they teach you how to build and market. If you ever have any questions about Facebook or anything else please don’t hesitate to ask me. I am here to help you and make sure you don’t fall into any of the scams that are out there. follow if messages that are sent have been received by the recipient . because I am not connected to the person on face book. I’m not quite sure I understand the 1st question about another procedure to follow if the message has been received by the recipient. Can you expound on that just a little bit more so I can make sure I answer it correctly for you. Also, I’m not seeing where the “privacy mode” and the setting “specific” is located. When I go to Settings > Privacy I see where I can change my settings for Who Can Contact Me > Whose messages do I want filtered in my inbox – I have mine set for Basic Filtering which is recommended. What this means is that those that I am friends with on FB can message and I could receive message in my inbox from friends of my friends but most of the time it will go in the “Other” box. The reason Facebook does this is to prevent behavior that others may find annoying or abusive. To ensure that someone got your message on FB that you may not be friends with, Facebook will allow you to pay for that service and when the message comes to the inbox, that person will not know that you paid to have your message sent to them. If you can explain to me the steps you took for the setting where you can change it to “specific” I might be able to help you a little bit better. why my facebook messanger show location to receiver that man is from united arab emarat,KSA or some thing else? Hi there! The reason you’re seeing where the man is from is because he has his location enabled. This means that whenever he messages someone, it will show where he is located.